APDA celebrated International Women’s Day today. Our Service Users and Staff put on a short drama piece to show the development and empowerment of Women. APDA, in global solidarity with its fellow disabled activists and D.D.P.O.s celebrated the International Day of Disabled Persons. UN Women theme for this year’s 16 Days of Activism against Gender-Based Violence (25 November – 10 December) under the UNiTE to End Violence against Women campaign is, Orange the World: #HearMeToo. APDA are pleased to announce that it has received a prestigious award in Community Group of the Year category at the London Asian Business Awards held at the Millennium Gloucester Hotel, Kensington. From the 10 finalists that were selected, we are proud to be the 2018 winner of the Community Group of the Year Award. On behalf of APDA the award was received by Michael Jeewa, Anna Felice, Pradip Shah and Rashmi Shah. UCLH medical students (2nd year) enjoying their day placements with APDA at our Brent Centre. Hosted by Lord Colin Low at The Houses of Parliament, Committee Room 4. The meeting launched the Alternative Reports by Deaf and Disabled People’s Organisations (Civil Society) to be submitted to the United Nations Disability Committee. 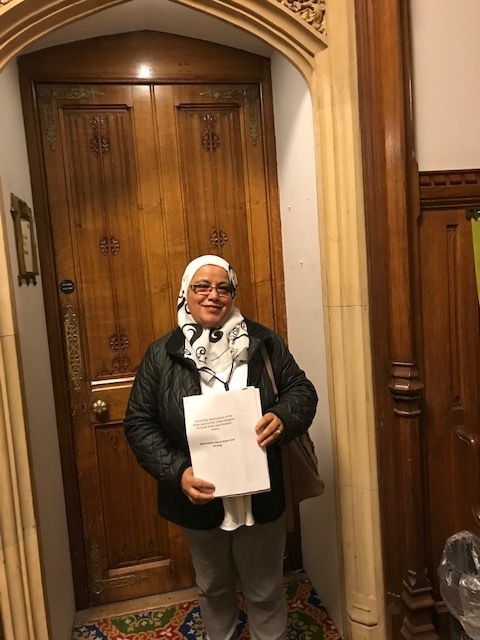 Zeenat Jeewa and Daya Lekamwattage at the House of Commons attending the launch event Hosted by Baroness Grey-Thompson DBE of an important Research paper from Inclusion London and University of Essex on “ Disabled People’s experiences of Employment and Support Allowance Work Related Activity Group”.